Andre Baccellia says he caught it. Chris Petersen says he didn’t. 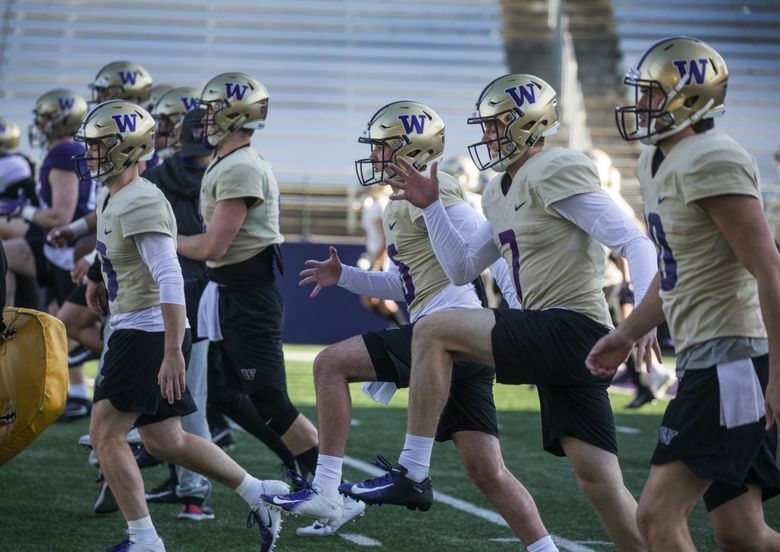 Here’s the setup: Late in Washington’s eighth practice of the spring Monday morning, junior quarterback Jacob Eason took a snap during a team drill from his opponent’s 7-yard line with six seconds left. His previous two attempts to punch the football into the end zone — both via passes intended for wide receiver Terrell Bynum — were catchable but ultimately fell incomplete. On third down, Eason took said shotgun snap, felt pressure and was flushed out to his right. Before arriving at the sideline, the 6-foot-6 signal caller fired a missile to Baccellia near the front of the end zone. Baccellia caught the ball but was ruled out of bounds. A horn sounded and the drill ended. Perhaps a video review would have overturned the ruling. 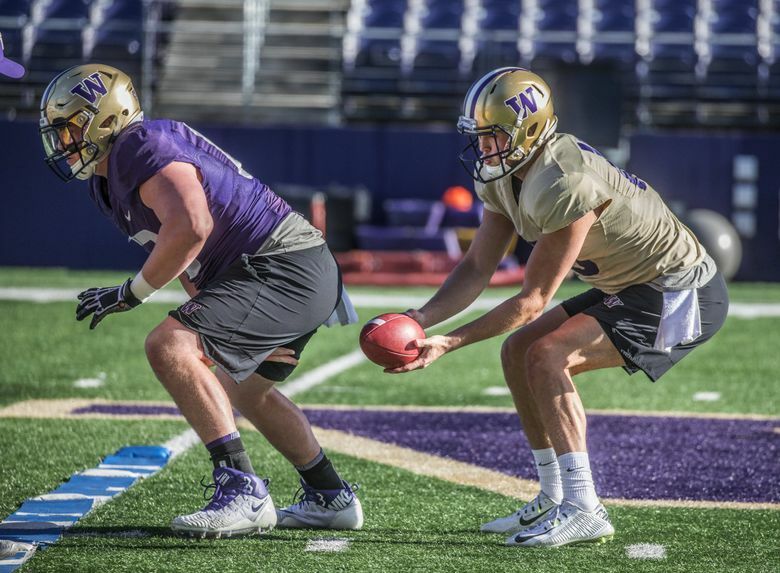 Instead, Eason — who again took the first starting snaps in team drills Monday — settled for completing 7 of 12 passes, without a touchdown or an interception, during UW’s scrimmage drills. Sophomore Jake Haener, Eason’s primary competition at the quarterback position, provided bigger highs and lows. The 6-0 sophomore completed 10 of 14 passes, with the blemish being an interception by early enrollee freshman safety Cameron Williams. 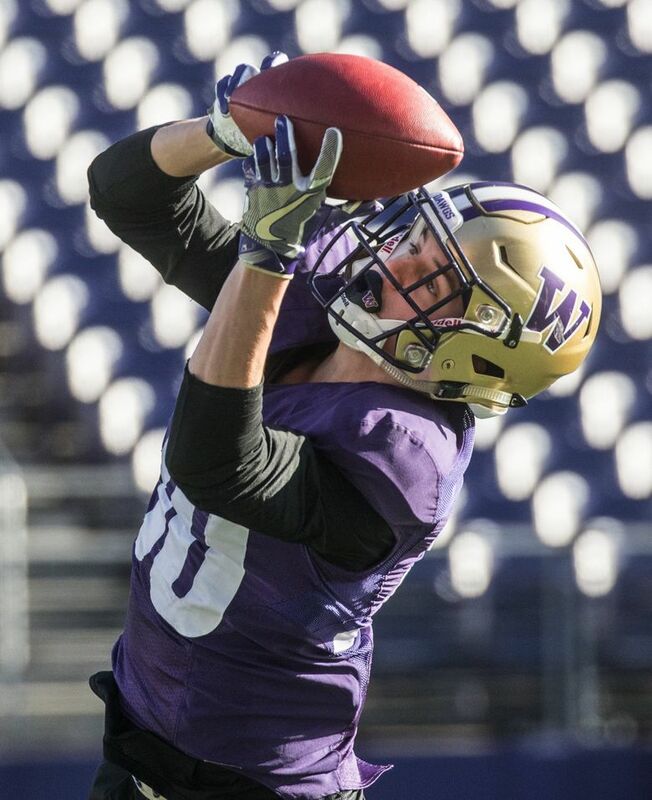 Haener sailed the ball over the head of 6-2 wide receiver Austin Osborne on a deep crossing route, allowing Williams to easily snag the interception. Haener later rebounded, finding Baccellia on a short crossing route the speedy senior turned into a 21-yard gain. The quarterback then called his own number from the 1-yard line and stuck the ball over the goal line for a touchdown. As for the other quarterbacks, redshirt freshman Jacob Sirmon fired a pair of touchdown passes during a 7-on-7 drill. The first was a minor miracle, as Sirmon escaped pressure, rolled to his right and fired into a crowd. Wide receiver Jordan Chin and tight end Jack Westover were both standing in essentially the same spot, and the football hit off of Chin’s hands before Westover finally secured it for the score. Sirmon added another touchdown on a crossing route to Bynum. Early enrollee quarterback Dylan Morris threw an unfortunate interception during the same 7-on-7 drill. Morris hit Westover in the chest in the end zone for a would-be touchdown, but Westover couldn’t handle it and cornerback Keith Taylor corralled the deflection. Here are some non-quarterback observations from Monday’s practice. Eason-Baccellia wasn’t the only disputed call Monday. Sophomore kicker Peyton Henry connected on field goals of 36 and 40 yards. That’s what we know. Henry also attempted another 36-yarder, and the results there are completely unclear. As the football sailed through (or around?) the uprights, one makeshift referee signaled the kick was good, while the other motioned it was no good. There was no clear consensus. Regardless of whether Henry was 3 for 3 or 2 for 3 on Monday, he’ll have to compete with highly touted kicker signee Tim Horn this fall. That’s when the real fun begins. 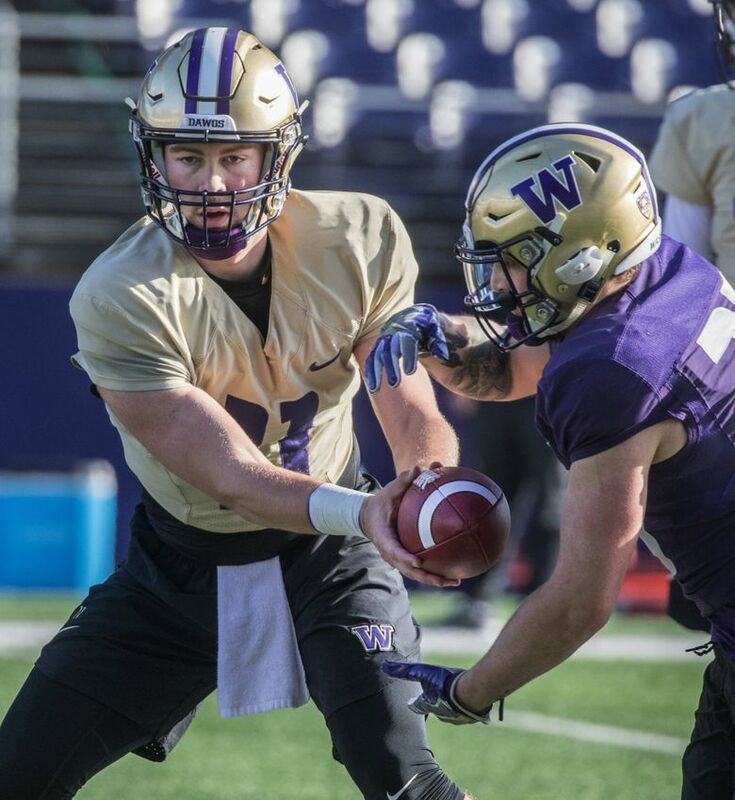 The following UW offensive players earned snaps with the starters Monday: quarterback Jacob Eason, running backs Salvon Ahmed and Sean McGrew, tight ends Hunter Bryant and Cade Otton, wide receivers Andre Baccellia, Terrell Bynum and Chico McClatcher, left tackle Trey Adams, left guard Luke Wattenberg, centers Nick Harris and Cole Norgaard, right guard Jaxson Kirkland and right tackle Jared Hilbers. 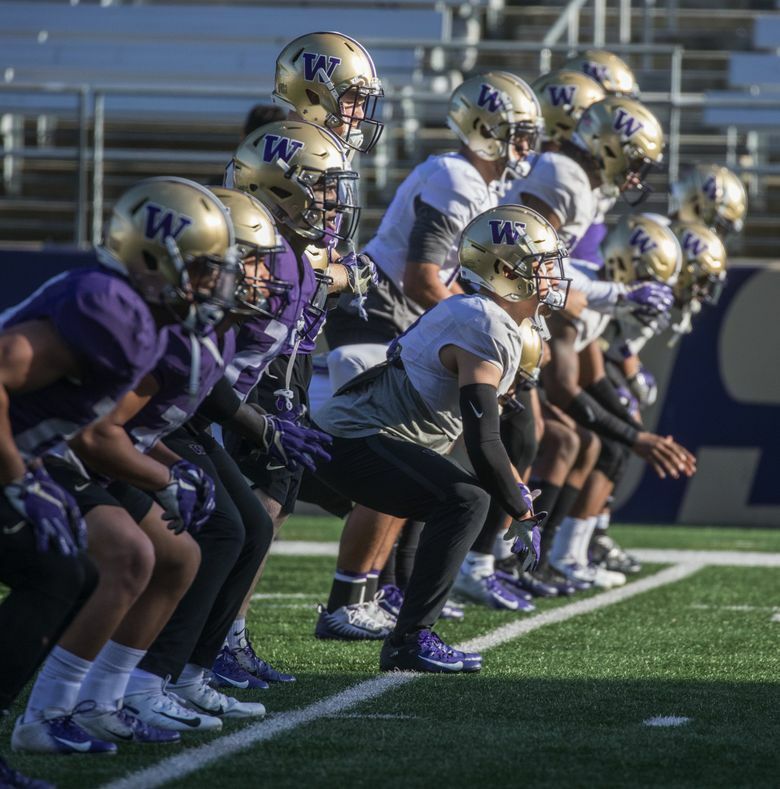 The defensive starters were as follows: defensive linemen Levi Onwuzurike and John Clark, outside linebackers Joe Tryon and Ryan Bowman, inside linebackers Brandon Wellington and Kyler Manu, cornerbacks Keith Taylor and Dominique Hampton, nickelback Elijah Molden and safeties Myles Bryant and Brandon McKinney. 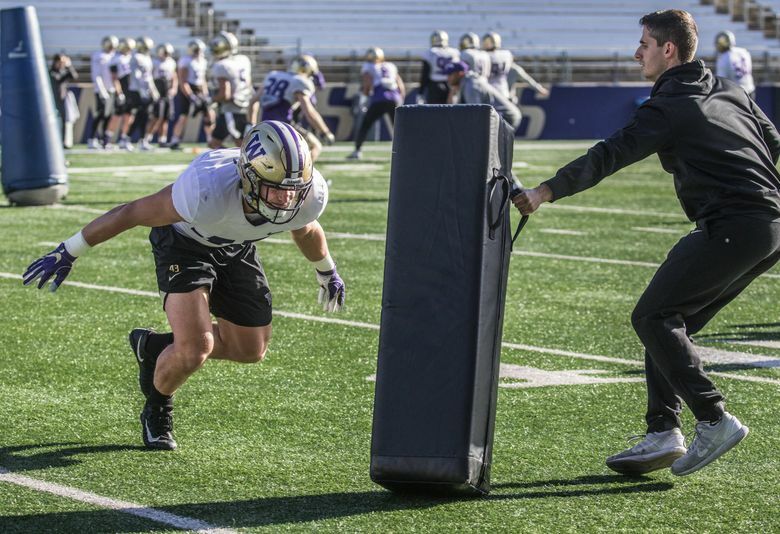 When the Huskies switched to a dime package, which includes six defensive backs, redshirt freshman cornerback Kyler Gordon was added to the mix. Petersen and Co. continue to cycle through different combinations along the defensive line. Behind Onwuzurike and Clark, the tandems of Benning Potoa’e and Tuli Letuligasenoa and Josiah Bronson and Sam Taimani received significant reps as well. The following players missed Monday’s practice with an injury: wide receivers Aaron Fuller, Quinten Pounds and Ty Jones, defensive tackle Jacob Bandes, linebacker D.J. Beavers, linebacker Ben Hines and early enrollee freshman offensive lineman Troy Fautanu. 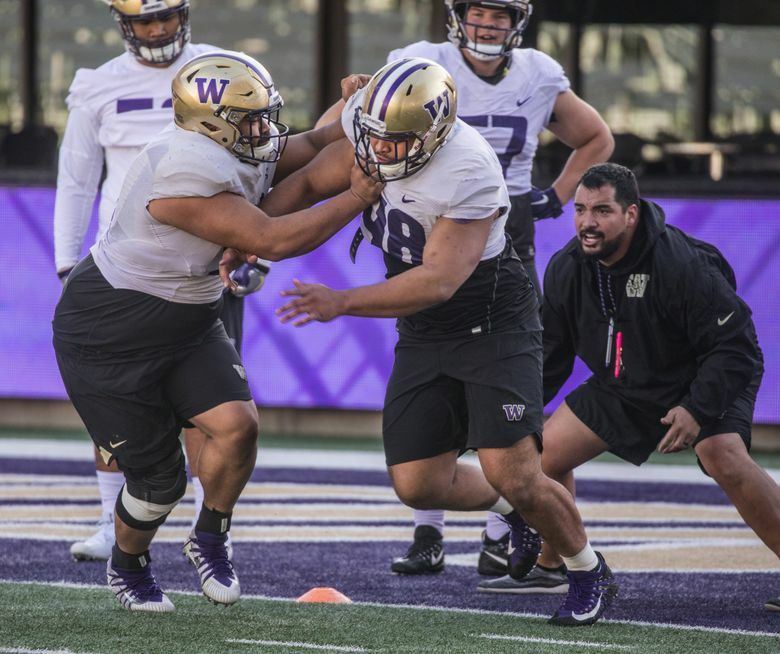 Fautanu had a walking boot on his left foot and was moving around on a scooter, after the 6-4, 296-pound freshman was injured during Friday’s practice. 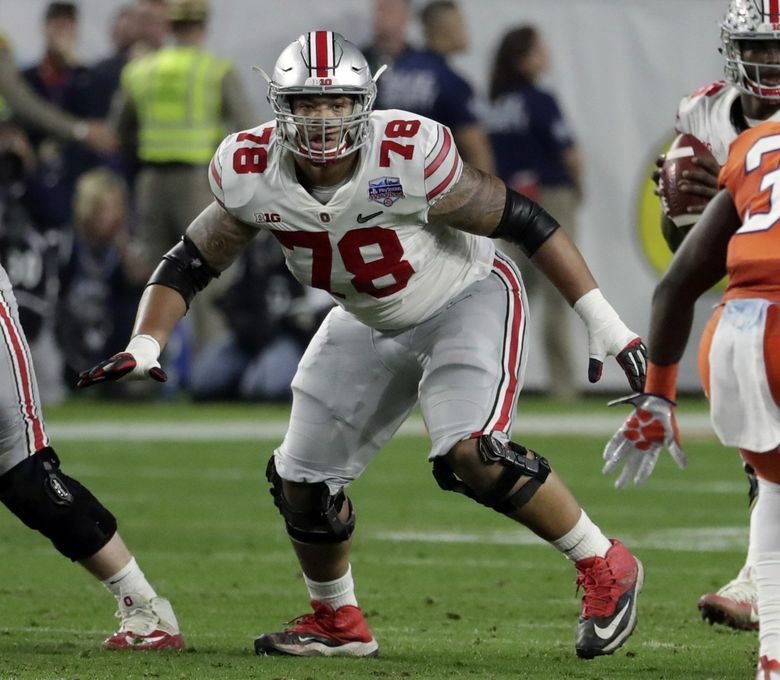 Safety Julius Irvin, outside linebacker Zion Tupuola-Fetui, defensive lineman Sama Paama and center Nick Harris continue to be limited as well. Harris took part in some of the team drills but was spelled by sophomore Cole Norgaard as well. 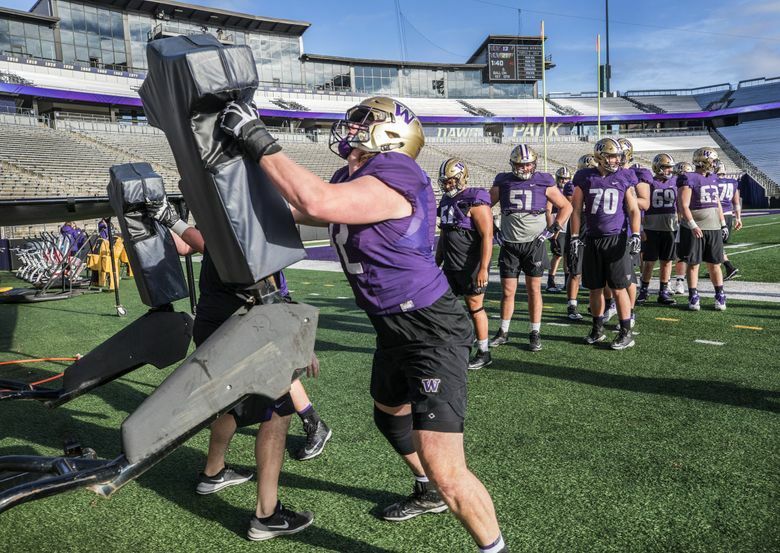 Senior defensive tackle Josiah Bronson had perhaps his best practice of the spring on Monday, powering up the middle to share a half-sack of Haener with redshirt freshman linebacker Jackson Sirmon. The 6-3, 290-pound senior continued to apply pressure and also swallowed up a running back on a shovel pass a few plays later. Senior wide receiver Chico McClatcher was utilized some with the starters Monday, receiving the ball on a fly sweep on multiple occasions. That’s the first time we’ve seen McClatcher with the starters in the spring. 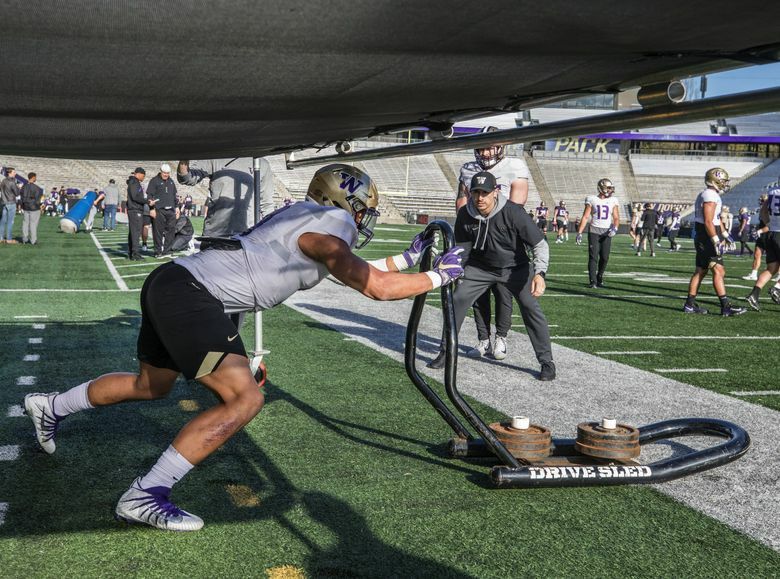 Sophomore Ariel Ngata, who has practiced both at inside and outside linebacker this spring, was back inside with the second team Monday. The expectation is for the 6-3, 216-pound sophomore to eventually move inside full time. 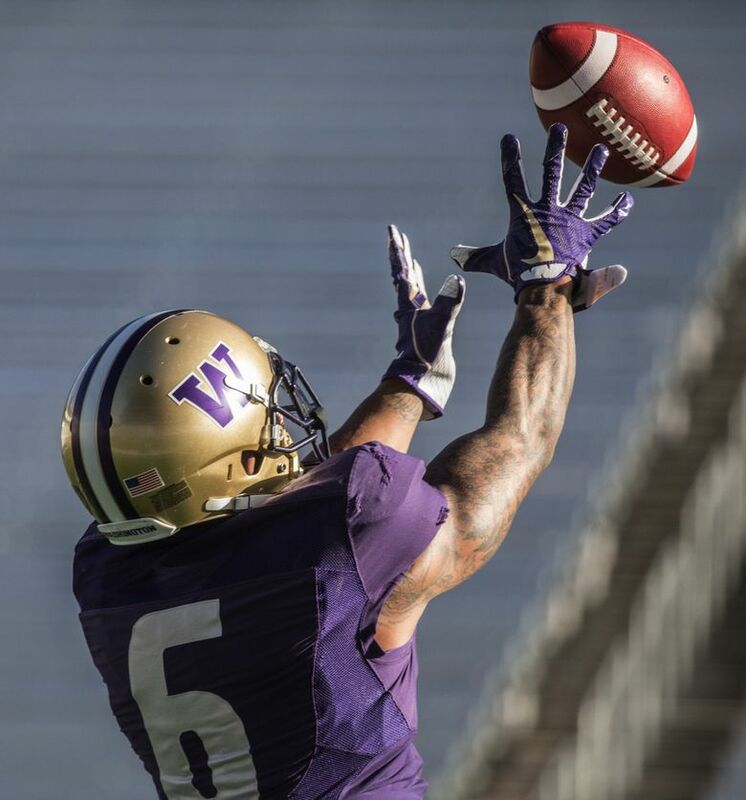 Washington practiced inside Husky Stadium for the first time in the six practices the media have been permitted to attend. 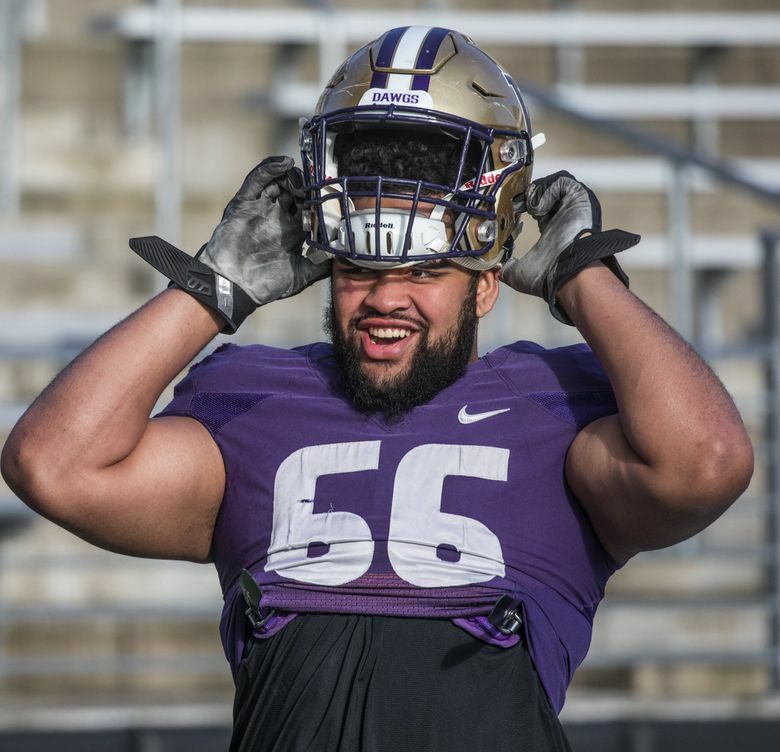 Recently departed defensive lineman Jaylen Johnson attended Monday’s practice.